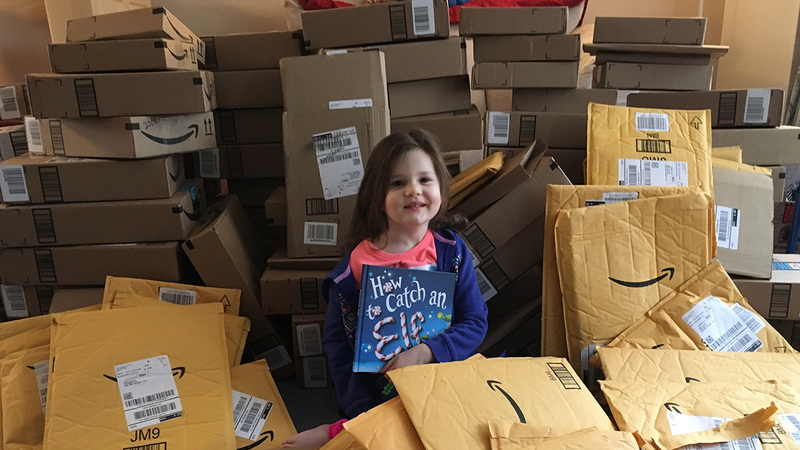 VINELAND, New Jersey -- The first delivery of books arrived Saturday for a 4-year-old girl from New Jersey battling a life-threatening brain tumor. Nearly 150 packages greeted the Tietjen family outside their Vineland home around 9:30 a.m. Some of the boxes contained more than one book, and one person even sent an Elsa dress. "She was beyond excited to see all of the books people so generously donated," mom Erin Tietjen said. "We also read all the notes and kind words people wrote. She's just so happy, and the outpouring of love is overwhelming." Her twin brother Clark also got in on the fun, helping to open all the packages like it was Christmas morning. Just a few weeks ago, the pair was running around, playing like all the other kids in the neighborhood. But then she came down with what they thought was a typical stomach virus. After Lena began having difficulty with motor functions on the right side of her body, her panicked parents rushed her to the emergency room. She was transferred to Children's Hospital of Philadelphia, where a scan revealed a mass deep within her brain. After surgery to drain fluid and five days in the ICU, the results of a biopsy were devastating: Lena was diagnosed with an inoperable malignant tumor and given just months to live without treatment. A relative set up a GoFundMe page to help cover the costs of treatment, travel and other related expenses. In the meantime, as the holiday season approaches, they are hoping family, friends and anyone willing to participate can help their strong little girl stay positive with what they have dubbed "Lena's Library." The early results are encouraging. "Thank you all for the loving comments and prayers," the family wrote on Facebook.. "It means so much to my family during this difficult time to see so many people willing to say a prayer, make a donation, send a book, make a call, text, or anything else that has been done. These last two weeks have been extremely difficult - but Lena is literally the bravest person that we know. She inspires us, and has taught us what courage is."